Advantages: Entertaining text, superb colour profiles, excellent selection of photos. When war broke out in Europe, there were many Americans who wanted to make a contribution. At this time America had not yet entered the fray so many of its citizens had to volunteer themselves to the services of other countries. The French Escadrilles were the recipients of those with panache for flying and it wasn’t long before the French government realized the propaganda value of a “squadron of American volunteers”. Thus on 16th April 1916, Escadrille N124 was officially formed. The French referred to the squadron as l’Escadrille Americaine, which was the source of German Diplomatic protests to the US Secretary of State. On 16th November, the French consented to a name change and the unit was called l’Escadrille des Volontaires. This lasted less than a month as the Americans thought the name was too dull. 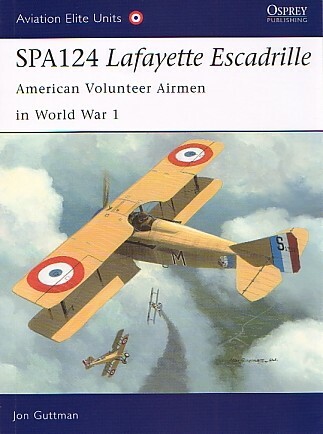 A new one was thought up and on the 6th December, l’Escadrille Lafayette became the official name of N124 (Lafayette being the name of a French volunteer who helped America’s cause in the 1770s). Jon Guttman has put together a very enjoyable read about the squadron and the men that flew in it. His style of writing keeps clear of the repetitious “who shot down whom” with a generous sampling of “other” events that keep the reader entertained. For example we find out how the two lion cubs, Whiskey and Soda, came to be the mascots of the unit and the uniform chewing habits of the former. Also, how many readers would know that Whiskey was also the recipient of a glass eye? We are informed about the origins of the Seminole Indian head that was used for the squadron insignia and the reasons for its change to that of a Sioux. The usual first hand accounts from the pilots are found throughout the book and this adds much colour to the already informative text. As before in this series, Harry Dempsey contributes the artwork. Here we find 39 side profiles with an additional 4 pages of clarifying plan views. 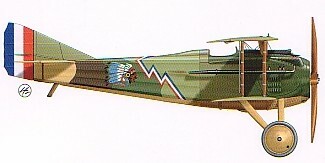 Types covered are the Nieuport 11, 16, 17, 24, 24bis, Spad VII, XIII and even a Morane Saulnier P.
These are done to a very high standard with hardly any repetition of artwork found in other Osprey publications. There are over 120 black and white photos contained within the 128 pages. These images are well chosen and provide a good cross section of subject matter. One photo in particular stands out and this is of Ernst Udet’s Fokker D III from Jasta 15. It shows a sheet metal dummy of a tail gunner mounted behind the cockpit. Jon Guttman relates a combat report where Gailland describes an encounter with “a small two-seater biplane of a type absolutely new”. It is suggested that this mystery aircraft could have been the one in question! The book finishes with the appendices that cover Escadrille 124 personnel, their victories and their length of stay in the unit. Further tables list the serial numbers of known aircraft that flew in the squadron, the markings they carried and the pilots that flew them. This addition to the Osprey series captures the unit from its scattered beginnings to its evolution into the 103rd Aero Squadron. It makes a fascinating read and although its number of victories was modest, the contribution it made to the “folks at home” cannot be over emphasized.